At the Bring Our Music Back (B.O.M.B.) Festival in Durham CT, there was an overall feeling of goodwill toward men. 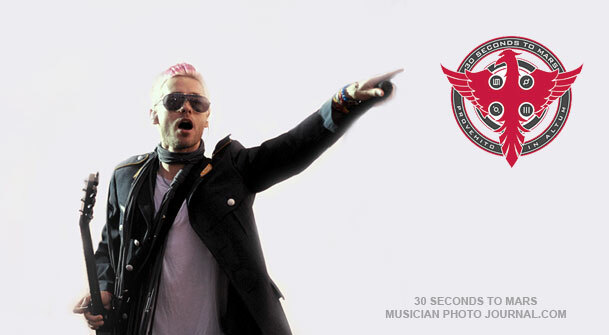 Hosted by a non-for-profit organization that donates all their net profits to children’s’ charities, it’s no wonder that 30 Seconds To Mars would choose to be a part of such a noble cause. The venue blends up-and-coming musical talent with non-commercialized musicians in a grassroots type of movement that is both entertaining and inspirational, providing more fun than you can handle, all the while supporting three very good causes. The positive energy of the crowd felt like a fellowship of mankind mixed in with high spirits, and combined with a sense of expectation that was fun and free-loving. Toilet paper lay strewn across the ground, littering the photo pit while toilet paper confetti floated gracefully in the air. Girl Talk was on the right side of the double stage; ending their set with what felt like a dance party that was so happening, you wished you could just jump right in. At one point the DJ played John Lennon’s ‘Imagine’ over the loud speakers. As the strains from the world-famous, forever immortal song drifted through the air, the crowd seemed to now more than ever have a sense of peace, love and harmony for all. The music was silenced as the party left the stage. Anticipation hung heavy in the air as we all held our breath, waiting for 30 Seconds To Mars to make their appearance. 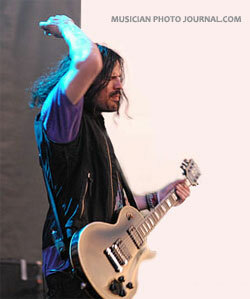 A few cheers went up from the audience when some eager fans caught a glimpse of a band member for one brief moment. 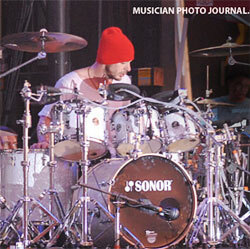 Shannon Leto was the first to smoothly take his place. He started a nice drum set, brilliantly creating an unforgettable intro for guitarist Tomo and singer Jared to make their grand entrance onto the stage. A roar went up from the crowd, peppered with several “I love you Jared!” It certainly seemed as though the band was intentionally creating a Beatle-like hysteria among their fans. Drummer Shannon owned his space, working his unique style of inventive percussion with rapid-fire drum beats that was both fun and amazing to watch while lead guitarist Tomo lit up the stage with searing guitar riffs and skillful fret-work. Singer Jared held nothing back with his chilling, heartfelt vocals. The fans loved the uplifting spontaneous energy of the band. 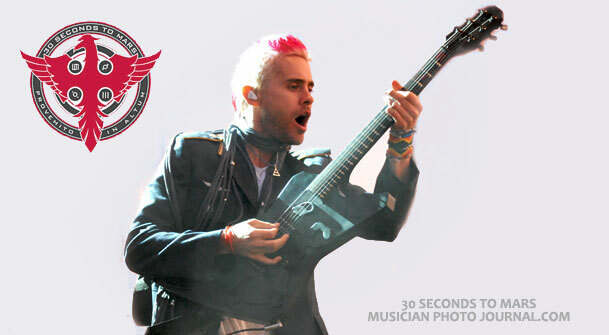 30 Seconds To Mars’ music is positive with a clear message. About halfway into their set, the singer, Jared took a picture of the audience while commenting “The sunset behind the crowd, it’s like a postcard from Connecticut.” Soon afterward, the Chesire Highschool Drumline band was called onto the stage. 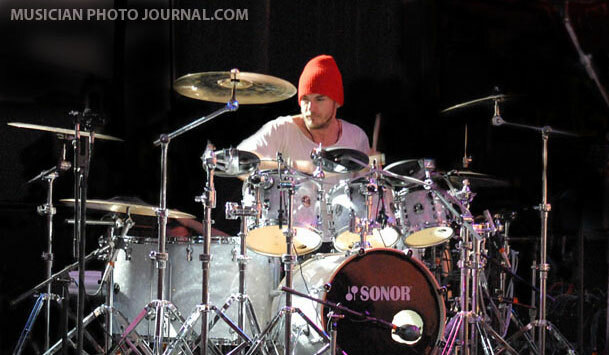 In a way, the students became a part of 30 Seconds to Mars, as the Chesire Highschool Drumline band played along to the music, while adding their own personal touches in a surreal and massive musical blend. It was touching to see the huge grins on the students’ faces as they rocked out in a bold, clever and quite unique way onstage alongside their long-standing heroes. For the final song of the night the singer made an open call for ‘A hundred fans or as many people as we can fit onstage’ to come up onto the stage and be a part of the last song in the set. At first, the crowd was in shock, then chaos ensued as everyone made a mad dash for the stage! I am pretty certain that there were more than just a hundred fans on that stage. Much to their delight, the individuals onstage received a rare treat as they were drawn into the energy and song of the truly talented and unique band. It was a fantastic show at a great venue and for a lucky few, an incredible experience and night they will never forget. You have a excellent Blog here Mate. Love your posts very informative, Please hold up the excellent work. Good job! Thank you for posting. This is certainly one of the most interesting websites I have seen. It’s so easy to get jaded, but there is honestly still some lovely stuff on the internet, and I believe your blog is absolutely one of the few!